Costa Mesa, Calif. (July 6, 2011) – M-1 GLOBAL’s sophomore U.S. outing packs depth and Europe’s leading mixed martial arts (MMA) promotion is making it available to fans outside North America via LIVE stream internet pay-per-view (iPPV) starting at 11 p.m. ET. 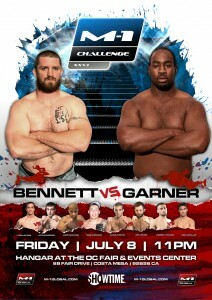 The MMA event titled M-1 Challenge: Bennett vs. Garner takes place from The Hangar in Costa Mesa, California. The long-standing promotion’s inaugural iPPV is hosted by AllBoxing.tv and is available at: http://allboxing.tv/en/content/m-1-challenge-xxvi-bennet-vs-garner. The best bang for under $3 Euro / $5 USD! The July 8th event is headlined with the rematch between the 2010 M-1 Selection Americas Tournament heavyweight finalists Pat Bennett (4-2) and Kenny ‘Deuce’ Garner (6-3). Garner last faced Bennett in the 2010 M-1 Selection Americas tournament finals, winning via convincing first-round TKO. He’s best known for his relentless self-marketing which he backs up with one-punch power. Bennett is a decorated collegiate wrestler and multidimensional fighter with deadly striking who’s primed for redemption. The Co-main event pits 2010 M-1 Selection Americas middleweight tournament winner Tyson ‘The Anti-Hero’ Jeffries (7-5) versus feared Russian striker Arthur Guseinov (7-2). As a marquee middleweight (185 Lbs.) bout, the clash sets the stage for Jeffries to battle back into title contention. Jeffries, a versatile fighter within Team Quest’s talented roster, won the 2010 M-1 Selection Americas tournament last September with a spectacular highlight reel, triangle-armbar over Mike Geurin. Arthur Guseinov is known for his deadly spinning back-kicks and head-hunting high kicks. Expect to watch a high-powered offensive drive directly into Jeffries’ path. The streamed card also features fierce lightweight (155 Lbs.) battles between feared German submission specialist Daniel Weichel (26-7) and former NCAA Division I collegiate wrestler Beau ‘Blackjack’ Baker (8-4) while unstoppable European lightweight Mairbek ‘Beckan’ Taisumov (14-3) faces scrappy Josh ‘Iron Heart’ Bacallao (6-3). The U.S. Army’s Captain ‘G.I.’ Jason Norwood (11-2) hooks up with the rage of Eddie ‘Crazy Face’ Arizmendi (14-4) in their middleweight tilt to kick off the telecast. Mauro Ranallo will call the action from ringside with Pat Miletich serving as analyst. The telecast will be produced by Chuck McKean and directed by Craig Farrell. The executive producer of SHOWTIME Sports® is David Dinkins, Jr. Founded in 1998, M-1 Global (www.M-1Global.com) has established itself in the realm of mixed martial arts (MMA) as the premiere entity for discovering and developing the world’s next-generation of superstar fighters. With offices in St. Petersburg, Amsterdam, New York City, Washington DC, Los Angeles and affiliates in Kuala Lumpur, Seoul, Tokyo and Paris, the M-1 brand has staged over 70 events worldwide including the M-1 Selection and M-1 Challenge events and its co-produced Strikeforce events in the United States. Captivating the live, television and broadband audiences with its superior production values and match-ups, M-1 events boast some of the sport’s top names including Fedor Emelianenko, Andrei Arlovski, Aleksander Emelianenko, Gegard Mousasi, Alistair Overeem, Ben Rothwell, Melvin Manhoef, Roman Zentsov, Stephan Struve and rising stars Shamil Zavurov, Guram Gugenishvili, Alexander Sarnavskiy and Vinny Magalhaes. 2011 marks a breakthrough year with two Selections tournaments across Eastern & Western Europe, North America and Asia and a full calendar of Challenge events fuelled by a talent-rich contention system ranking M-1 Global’s Champions amongst the greatest in the sport. M-1 Global’s greatest asset is the number one heavyweight fighter in mixed martial arts history, Fedor Emelianenko. With daily coverage on all MMA-related websites in the world, and articles in Time Magazine, LA times and New York times, Fedor and M-1 Global make a lifetime match serving as the catalyst to grow MMA in the 21st century.